So, here’s what I’m asking. If you are a leftist, what three books do you believe would best persuade thoughtful people who disagree with you that they are in error? And if you are a conservative or libertarian, what three books do you recommend to thoughtful leftists? In each case, assume the reader is intelligent and educated. Assume as well that he has a life, which means you probably shouldn’t roll up in here with Mises’s Human Action. Unless you really want to. Six Modern Myths about Christianity and Western Civilization by Philip J. Sampson. Most people have many misconceptions about Christianity that keeps them from being able to consider it as a viable worldview. In this excellent and heavily footnoted book, Sampson goes over Galileo, Darwin, the environment, missionaries, the repression of the human body, and witches to effectively remove these as potential stumbling blocks. Handbook of Christian Apologetics by Peter Kreeft and Ronald Tacelli. There are plenty of good books on general apologetics, but I would choose this one because it has the most breadth of any other I've read, and because it is the most accessible. The Son Rises by William Lane Craig. Again, there are plenty of books defending the resurrection, many of which are excellent. I would choose this one because Craig's argument is very simple and straightforward: there are several facts about Jesus' alleged resurrection that are accepted as demonstrably historical by the consensus of scholarship (his burial, the empty tomb, Jesus' post-mortem appearances, and the early belief in the resurrection) and the hypothesis that Jesus rose from the dead is the best explanation of them. By basing his arguments on facts that are acknowledged by the scholarly community, Craig is able to present a case based on premises that are not controversial. His conclusion, of course, is controversial, but he explains well why the resurrection is the best explanation of these four facts. The reason for choosing these three is because the first one clears the way, the second one explains the reasons for accepting Christianity in broad strokes, and the third gives a detailed (but not difficult) defense of one of Christianity's central claims. Obviously, there are many other subjects that I would like to cover -- Christianity and science, Christianity and culture, catalogues of worldviews, common objections to Christianity, etc. (I posted a longer list here) -- but if I had to limit it to three books, I would probably choose the above. Family Guy often makes me laugh, but I usually feel the need to shower afterwards. Their season opener deals with a couple of subjects Quodlibeteers will be familiar with: the multiverse and the claim that Christianity ushered in "dark ages of scientific repression." You can watch it here, it's pretty funny, but be warned: the language is R-rated at best, there's a lot of poop jokes, and it has one of the most tasteless things I've ever seen (and it's not the Flintstones bit). We once had to abandon the idea of earth being at the centre of the universe. Now, we need to confront an even more profound possibility: the universe itself might just be one universe among many. In Search of the Multiverse takes us on an extraordinary journey, examining the most fundamental questions in science. What are the boundaries of our universe? Can there be different physical laws from the ones we know? Are there in fact other universes? Do we really live in a multiverse? This book is a search - the ultimate search - exploring the frontiers of reality. Ideas that were once science fiction have now come to dominate modern physics. And, as John Gribbin shows, there is increasing evidence that there really is more to the universe than we can see. 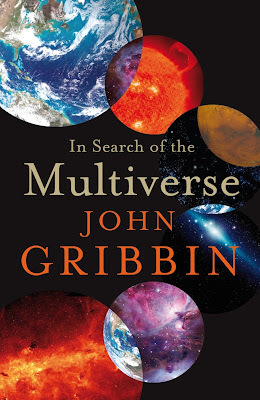 Gribbin guides us through the different competing theories (there is more than one multiverse!) revealing what they have in common and what we can come to expect. He gives a brilliant tour of the current state of cosmology. Gribbin expounds at length the usual string theory anthropic landscape/multiverse ideology, carefully avoiding introducing any mention of the fact that there might be quite a few scientists skeptical about it. The intelligence required to do the job may be superior to ours, but it is a finite intelligence reasonably similar to our own, not an infinite and incomprehensible God. The most likely reason for such an intelligence to make universes is the same as the reason why people do things like climbing mountains or studying the nature of subatomic particles using accelerators like the LHC – because they can. A civilization that has the technology to make baby universes might find the temptation irresistible, while at the higher levels of universe design, if the superior intelligences are anything at all like us there would be an overwhelming temptation to improve upon the design of their own universes. This provides the best resolution yet to the puzzle Albert Einstein used to raise, that ‘the most incomprehensible thing about the Universe is that it is comprehensible.’ The Universe is comprehensible to the human mind because it was designed, at least to some extent, by intelligent beings with minds similar to our own. Fred Hoyle put it slightly differently. ‘The Universe,’ he used to say, ‘is a put-up job.’ I believe that he was right. But in order for that ‘put-up job’ to be understood, we need all the elements of this book. Except if the race of aliens are screwing with us, like a six year old forcing insects to fight in a jar. In other news Andrei Linde and Vitaly Vanchurin have been trying to calculate a number of possible universes in the multiverse based on quantum fluctuations in the early state of the universe. Their final number for this is that at least 10^10^10^7 universes out there. Unfortunately the human brain is ‘only capable of 10^10^16 configurations’ so calculating the probabilities is going to be a tad difficult. In even more news theoretical physicists Holger Nielsen, from Denmark, and Masao Ninomiya, from Japan, have concluded that the discovery of the Higgs Boson could be so "abhorrent to nature" that it can "ripple backward through time" and stop the Large Hadron Collider before it could make one. He said that his theories may even provide a ‘model for God’ who ‘rather hates Higgs particles, and attempts to avoid them’. Now there’s an example of science and religion working in tandem. Have a dinosaur infestation?, need the problem solved quickly. What is the answer?. Well one option is to drop an enormous rock on the little blighters from orbit. 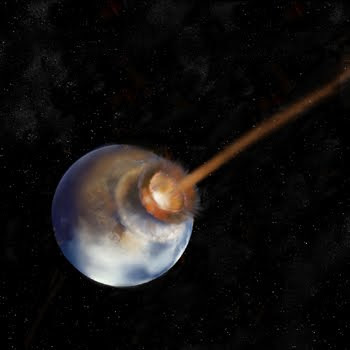 And in fact there is a star candidate for this in the Chicxulub impact event. This would have hit with the force of 100,000,000 megatons of TNT on impact, unleashing mega tsunamis and dousing the earth in acid rain. That should deal with them shouldn’t it?. Well no, not according to Gerta Keller of Princeton University in New Jersey, and Thierry Adatte of the University of Lausanne, Switzerland. In a recent analysis they used evidence from Mexico to suggest that the Chicxulub impact predates the K-T boundary extension event by as much as 300,000 years and that it wasn’t a significant enough blow to species diversity. Also at El Peñon, the researchers found 52 species present in sediments below the impact layer and counted all 52 still present in the layer above it, indicating that the impact has not had the devasting biotic effect on species diversity as has been suggested. "Not a single species went extinct as a result of the Chicxulub impact," Keller said. In contrast, she noted, at a nearby site known as La Sierrita where the K-T boundary, iridium anomaly and mass extinction are recorded, 31 out of 44 species disappeared from the fossil record at the K-T boundary. Instead, Gerta Keller argues, the dinosaurs must have been taken out by killer volcanos. She speculates that massive volcanic eruptions at the Deccan Traps in India may be responsible for the extinction, releasing huge amounts of dust and gases that could have blocked out sunlight and brought about a significant greenhouse effect. The volcanos would have resulted in half a million cubic miles of lava flooding the western part of India in a short amount of time. "We have worked extensively throughout India and investigated a number of the localities where Sankar Chatterjee claims to have evidence of a large impact he calls Shiva crater," Keller wrote in an e-mail along with colleague Thierry Adatte of Switzerland's Universite de Neuchâtel. "Unfortunately, we have found no evidence to support his claims... Sorry to say, this is all nonsense." ‘for the first time that the number of different types of dinosaur was declining well before their final extinction, in spite of the fact the amount of rock available for preserving dinosaurs was at its peak. The mammals were on their way up, the Dinos were on their way down. Giant rocks from the sky don’t help though. 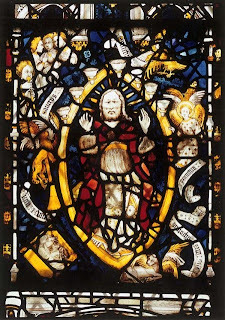 If we were to construct a historical account of the natural philosophy of the Middle Ages based purely on hearsay and modern prejudices (a not uncommon practice), we might well conclude that the intellectuals of the era simply sat around saying ‘God did it’. After all, people of the era were highly religious; the Bible says that God created the word, so that must have been the end of the discussion. Well, such an answer may well have satisfied a great number of medieval peasants. Medieval thinkers did not consider it to be an adequate response and they constantly sought better answers with the intellectual tools available to them. One important focus for inquiry of the natural philosophy of creation were the opening chapters of Genesis. This describes God’s creation of the world and provides a logical place to ground the study of astronomy, physics, earth sciences, matter theory, botany, zoology and all other branches of natural philosophy. 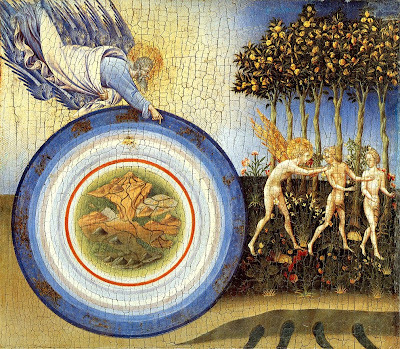 The Medieval method of study was by commentary, and one of the best places to begin a generalised natural philosophical discussion were the six days of creation. Many treatises on this period were written and the genre this was done in is known as Hexameral literature or Hexamera. In some cases, particularly later, it is clear that the authors were more interested in the natural philosophy elements than they were in the biblical exegesis. In these instances the biblical commentary format is playing the role of a coherent framework around which you can build a natural philosophical system. The Hexameral tradition was born in the early days of Christianity. Two writers were highly important, one of them in the Greek world, the other in the Latin World. One was St Basil, who was born around 329 and died in 370. The other was St Augustine. Basil’s commentaries were given in the form of homilies. These were given largely to audiences of tradesmen and designed to relate the creative handiwork of God to the kind of crafts which were engaged in at the time. In fact, what Basil was trying to do was elevate the role of the craftsmen by comparing it to God working upon his creation and putting it together piece by piece. The homilies contain evidence that he knew the Greek philosophical tradition quite well, although his intentions are purely devotional. St Augustine was to prove more influential and set the tone for much later Hexameral literature with his ‘Literal Interpretation of Genesis’. What Augustine does here is very interesting. The rules he sets down for biblical interpretation are firstly that they have to be logical. Secondly, they also have to explain the expressions used in the text. Most importantly, interpretations given must be in accordance with the currently received state of scientific (natural philosophical) knowledge. So, given Augustine’s criteria, a not particularly smart interpretation of Genesis in the 21st century would be that the earth is really 6,000 years old when it blatantly isn’t. 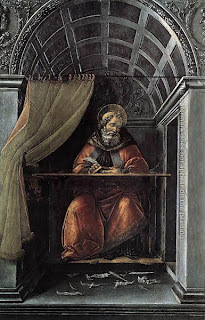 Augustine himself rejected the idea of six days of creation in favour of an instantaneous event, where God created everything in a moment. Over time (for time was created with creation) rational seeds (rationes seminales) which had been implanted in the world would develop into different shapes and forms under the influence of local conditions, or to fit with local conditions. What is created in an instant therefore becomes actualised over time. In the medieval period Hexameral literature was heavily influenced by naturalism. What ‘naturalism’ means in a Medieval context is that arbitrarily miraculous actions of God are not acceptable explanations for natural philosophy. Medievals were very clear on this. Yes God could do anything, but just because he could do something did not mean that using his omnipotence was legitimate as an answer to questions. This notion was explained by referring to primary and secondary causes. In the Medieval view, God is the ultimate primary cause of everything. That fact has very little explanatory power, and Medieval theologians viewed an unnecessary recourse to the primary cause as ‘a cop out’. Secondary causation, the action of natural forces which were created by God, were adequate and proper explanations and this is where the focus of inquiry would be located. Hence God creates nature and then forces within nature would have their subsequent effects. Theologians held that God almost always works through secondary causes and within the framework of the world he created. His direct intervention causes miracles, and these are very rare. An example of this would be an eclipse. These happen when the moon passes between the earth and the sun, so we don’t need a recourse to God. However the eclipse at the crucifixion happened during a full moon, so it could not have happened naturally; hence it was a miraculous disputation in the usual running of nature. By the end of the Middle Ages, theologians were already trying to explain miracles using natural causation, so the parting of the Red Sea was explained by a wind sent by God, a secondary cause. While man could not possibly comprehend the creation ex nihilo, everything after than moment should be explained using secondary causation, with the exception of those unusual contrary to nature occurrences. This approach represents a confidence in the power of human reason, to comprehend a rational and orderly world. It presumably stems from a Christianised Platonism which emphasised the power of the human intellect and the salvific nature of knowledge. Neo Platonists in the 12th century certainly had a lot to say about man’s ability to know things. 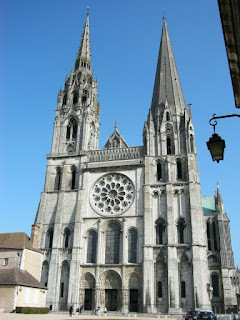 In the 12th Century the School of Chartes was home to both Thierry of Chartres and William of Conches who both showed a keen interest in the natural philosophy of Creation. Thierry wrote a treatise on the works of the Six days. This makes its way through Genesis 1 verse by verse, and each verse provides the structure for one chapter in his commentary. He makes it clear at the outset that he is going to expound the text ‘according to nature’. Thierry begins by positing the primary cause, God (Aristotle’s Philosophy posited four causes, this wasn’t available in the west yet but was known by digests). Thierry then posits the causes of the world in Aristotle's terms. God the father is the efficient cause, the creator. God the son is the formal cause and the final cause is God the Holy Spirit. The material cause is the four elements which are created by God in the beginning. Using the second person of the Trinity, the son (the word) as the formal cause shows the influence of Platonism. What he is doing is rewriting the Timaeus in Christian terms and combining it with Genesis. All these references to divine causation disappear after the first page and the rest of creation unfolds ‘naturally’. So where God separates the waters in Genesis, Tierrry uses natural causes to make this separation occur. The celestial fire heats the waters and causes them to evaporate. The vapours form clouds, thus forming the separation from the ocean to the clouds (this comes from St Basil). The land appears because the water is evaporating, so again, a natural explanation. ‘You attribute everything to the quality of things and nothing to the creator. Surely the creator was able to keep the waters there, freeze then and keep them suspended contrary to nature’. ‘What is more foolish than to assume that something exists simply because the creator can make it. Whoever says God makes anything contrary to nature should either see that it is so with his own eyes or show the reason for it being thus, or let him demonstrate the advantage of it being so’. This is an argument we will see between science and religion down to our own time. What (if anything) do we attribute to God’s power and what do we attribute to secondary causation? William now takes it even further. He claims that life itself arose from the natural action of heat on mud and even that man arose from the primordial mud (God does emerge at one point to give him a rational and immortal soul). In fact, William says that since mans body came about by the natural action of elements working on one another within the course of nature, several species of man could have developed and the natural actions are still at work today. A new species of man could arise by natural forces. But William says that though this seems possible we have never seen it happen, so perhaps God wills against this. William then says that natural causation is constantly acting, but it requires Gods will to continue. God therefore underwrites and maintains the laws of nature. This would eventually become a difficult theological point. What is important to take from these two figures is their insistence on naturalism; that explanations in natural philosophy have to come about in a natural way from natural forces. Furthermore we see these Hexamoral treatises as places where speculative natural philosophy can be advanced. Two later figures were Robert Grosseteste and Henry of Langenstein. Robert Grosseteste (the last name means ‘big head) was the Bishop of Lincoln. He was born in 1168 and died in 1253. He also promoted Platonic readings of Genesis, but he had a particular interest in one thing; light. In the first passages of Genesis, this is the first creation. Light is also a key aspect of neo-platonic thought where the world is created by a single emanation from a self sustaining, self sufficient God. He radiates his goodness like light, and this creates the world. This idea was Christianised and we even see the emphasis on light in the building of Gothic cathedrals. For Grosseteste, light is a vehicle of creation and knowledge. He favours an instant of creation and believed that the six days are metaphorical. The way God creates the world is this. He creates a dimensionless point of matter and a dimensionless point of light imposed upon it. These are dimensionless because Augustine had speculated that time was ‘created by God’ (so on Augustine’s reading, people who ask what God was doing before creation are being silly as there was no time). Grosseteste takes this further and says that the dimensions do not exist before God creates them. Essentially all God does is to create these points since light naturally radiates from it’s source in a spherical way carrying the matter with it. This happens until it becomes so diffused it stops radiating and the spherical cosmos is created. He then elaborates how the celestial spheres are created. In the next century, Henry of Langenstein wrote a piece of hexamenal literature which proved to be a veritable compendium of 14th century natural philosophy. He is predominantly Aristotelian in outlook rather than Platonic but he does draw on a wide range of sources. To sum up, what we see here is that theology provided a framework and a context in which natural philosophy could be done. Experimental knowledge in the case of Grossteste, arguments from common experience in the case of William of Conches, were used to further the study of the natural world. Theological and scientific speculation went hand in hand and, in this way, myths provided a sort of scaffolding for the human imagination. Scripture did not restrict scientific enquiry, but instead provided an impetus and a locus for natural philosophical speculation. Plenty of lessons there for today. 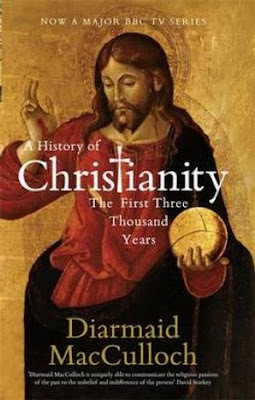 Diarmaid MacCulloch, author of the much acclaimed ‘Reformation – Europe’s House Divided’ has recently completed his ‘A History of Christianity – The first three thousand years’. The book was praised by Archbishop Rowan Williams but panned by Paul Johnson in the Spectator, who writes ‘I can’t imagine anyone reading it for pleasure’ and takes it to task for being too politically correct. [Winthrop’s associates] ignored the other component of English Worship, the Prayer Book: Laud had tainted that irredeemably. With great satisfaction John Winthrop recorded in his journal for 15th of October 1640 the miracle of the Puritan mice. One volume in his son’s library was a Greek New Testament, a book of psalms and the Book of Common Prayer all bound up together. Mice gnawed at every leaf of the prayer book, but left the New Testament and the Psalter intact. Thus Mr Winthrop’s library, like Massachusetts itself, put it’s mark of scorn on the popish Church of England liturgy. Perhaps we might add one more contender to the pantheon of theistic arguments; the argument from devout rodents and parrots with doctorates in Theology; or perhaps they could be more usefully employed in the resolution of religious disputes. What has theology ever done for science? What has theology ever done for science? asks Dan Dennett. ‘Quite a lot’ replies Denis Alexander in a recent article posted on the Faraday Institute website, and proceeds to reel off four main themes. I wrote something similar a while back, based on the Faraday Lecture series (which are a fantastic resource). A second theme that we often find in the early natural philosophers is the idea that the contingency of God’s actions encourages an empirical attitude towards the natural world. The God of the Bible can do what he likes, and it is up to natural philosophers to determine this empirically, it cannot be worked out from first principles as the Greek rationalists mistakenly thought. Contingency stems from the free will of the omnipotent Creator. This is one of the key developments of the Middle Ages, which is documented in God’s Philosophers. I attempted to summarise Harrison’s intriguing thesis, here. The one thing that sticks out at you from early modern treatises of Natural Philosophy is their tendency to stress the fallen nature of humanity and to recommend experiment as a way of overcoming it’s effects. I wrote something on this back here. I should add that James’s book shows that this attitude emerges in the Middle Ages. We find the clockwork universe trope in the writings of John Buridan for example. Because science is an intellectually difficult enterprise, there is value in an under-pinning metaphysics which guarantees that scientific knowledge has real value. This under-pinning was provided during the emergence of modern science by the belief that God had made rational human minds with the ability to gain true insights into a rational universe with properties governed by God’s rational laws. True, as noted above, these minds were fallen, so their deficits needed to be supplemented by experimental data. But the data could be trusted because it was God’s universe that was being investigated. This optimism in the trustworthiness of human knowledge helped carry science along on its crest for centuries, sometimes pushing scientists over the top of the wave into straight hubris. Today that optimism in the reliability of knowledge is gone, and the post-modern suspicion of meta-narratives sits uneasily with a scientific enterprise that seeks to maintain the reliability of its knowledge, conveying science to a public that hardly knows what truth is any more. Here are a couple of important books available online that contrast the Bible and the Qur'an. The first is The Bible, the Qur'an and Science by Maurice Bucaille, a medical doctor, who argues that while the Bible has numerous scientific and historical mistakes, the Qur'an is free of such errors. Originally written in French, it has been translated into many languages. In response to Bucaille's book, William Campbell, also a medical doctor, wrote The Qur'an and the Bible in the Light of History and Science where he argues that precisely the opposite is the case: the Bible not only contains no scientific errors, it actually predicts scientific discoveries. He references Hugh Ross a few times in defense of this. The Qur'an, however, makes many claims that have been disproved by contemporary science. It can be read online in several languages, including Arabic, French, Indonesian, and (fortunately) English. I have both books on my shelf, and find Bucaille to be reading things into the Bible and the Qur'an that aren't there; and the things he reads into the Bible just happen to be falsehoods while the things he reads into the Qur'an just happen to be truths. If he applied the same standards to the Bible that he does to the Qur'an it would pass with flying colors; conversely if he applied the same standards to the Qur'an that he does to the Bible he would dismiss it as riddled with error. Campbell eviscerates Bucaille. Even though his book has a very particular target -- not only is it focused on contrasting the two holy books and religions, but it is a point-by-point response to another book -- I think it's one of the best books on Christian apologetics that I've ever read. Anyway, I recommend reading both books before drawing your own conclusions. Let me make two caveats: first, both Bucaille and Campbell are skeptical of biological evolution, however I don't think this affects their respective cases. Campbell only mentions it briefly in a "short chapter without a number" and Bucaille discusses it in another book L'Homme D'Ou Vient-il? Les Reponses de la Science et des Écritures Saintes. Other than this, they both accept the findings of contemporary science. Second, it should be noted that in comparing these two religions both books tend to take the easy route by applying a sort of one-to-one correspondence between their respective elements. So the Qur'an is contrasted with the Bible, and Muhammad is contrasted with Jesus. This is certainly understandable; it's just easier to compare their holy books with each other and ditto for their founders. But this inevitably applies categories of one of them to the other that do not hold, resulting in inappropriate comparisons. For example, Christianity believes that Jesus is the ultimate revelation of God. But no Muslim would say this of Muhammad; rather, they would say this of the Qur'an itself. So in contrasting these two religions, we should be comparing Jesus with the Qur'an, not Jesus with Muhammad. Obviously this creates even worse problems, because now we have to compare two unlike things (a person and a book). So if Muhammad is not to Islam what Christ is to Christianity, how does Islam depict Muhammad? In Islamic theology, Muhammad is the means through which God's ultimate revelation comes. So any comparison of these two religions should look for something in Christianity to which such a description could apply. I've seen two possibilities suggested. The first is the Bible, since it is, in a sense, the "messenger" through which we hear about Jesus. However, it should also be noted that the Bible is often called God's Word, although in a different sense than Jesus is (we shouldn't worship the Bible, for example). This has some interesting consequences. My wife and I know a young lady from Turkey who was raised a Muslim but rejected it after reading the Qur'an. Once, when the three of us were discussing the nature of Islam and Christianity, I pointed out to her that there are plenty of Christians who do not accept the inerrancy of the Bible (that is, that the Bible's original manuscripts were completely true in everything that they actually affirmed). In fact, I told her that C. S. Lewis, one of the 20th century's most-read Christian authors, rejected biblical inerrancy, and not only was he still a Christian, he was a fairly traditional Christian. And not only was he a traditional Christian, he was a champion for Christianity. I told her that I didn't think a Muslim could believe that the Qur'an may have errors and still be a traditional Muslim. She responded that such a person couldn't be a Muslim in any sense (although some people, like Irshad Manji, might disagree). The other Christian parallel to Islam's Muhammad that I've seen suggested is Jesus' mother Mary. Christianity has always had a very high view of Mary, since she was considered worthy of such an incredible blessing (and curse) of being the mother of the Messiah. Sometimes respect for Mary has led to her being venerated. This is similar (to some extent) to the Islamic veneration of Muhammad. I don't think it's inappropriate to try to understand other religions in light of one's own religion. But we have to first understand other religions on their own terms before we can compare them to our own. Otherwise, we will inevitably end up critiquing a straw man. UK politics is probably of greater interest to me than most of the readers of this blog, so I hope I will be forgiven for a brief foray, perhaps because one of the principle players this weekend was very nice about God’s Philosophers. As you may know, today the Irish voted for the second time on the Lisbon Treaty which stands as a constitution for the European Union (a federal super-state into which the British have been sucked unwillingly by the duplicity of their leaders). The Irish are voting again because during the first referendum they failed to produce the answer that their masters required. David Cameron, the prospective Prime Minister of the UK, has also promised a referendum after the next election (if he wins it, which he almost certainly will). But if the Lisbon Treaty is ratified before the election, unpicking it becomes very much harder. Many are expecting that the Irish will vote ‘Yes’ and Cameron will then withdraw his own referendum promise. If this happens, it will become known in Conservative Party annals as ‘the Great Betrayal’. Cameron probably knows this which is why there remains hope that he will honour his commitments. But suspicions remain. This is where the guy who reviewed God’s Philosophers comes in. Daniel Hannan (no relation) is the conscience of David Cameron’s Conservative Party. Whatever compromises Cameron must make to win and keep power, he knows he will maintain the approval of the party base as long as he keeps Hannan onside. Presently, Cameron has Hannan’s unequivocal support. And as long as Hannan says he trusts Cameron to deliver a referendum on Europe, the base will trust him too. Which is why the most important political blog this weekend is Hannan’s. If Cameron appears to waver on a referendum, watch which way Hannan goes. It will tell you, several years in advance, whether Cameron will ultimately be a successful Prime Minister or spend his entire career fighting with his own party. Here's an interesting situation in the States. Many states allow concealed handgun licenses (CHL) but some prohibit concealed carry in places of worship. This raises the issue of the role of self-defense and pacifism in religion, as well as whether the State should be saying anything about it at all. Obviously not all churches have the same beliefs about the legitimacy of self-defense and defense of others as does the New Life Church. This brings use to the second violation of the First Amendment. The morality of using deadly force when necessary to protect innocent lives is a strongly debated topic among various denominations. The early Christians disagreed on the topic. Historically, the standard Jewish and Catholic view was that self-defense was a right and defense of others was often a duty. Some Christians, particularly since the 20th century, take an opposite view. Likewise, many adherents of the major religions of Asia also support self-defense, while some (especially some Therevada Buddhists) do not. These doctrinal differences about self-defense represent very important, sincerely-held differences in religious beliefs. A religion is, after all, not just about the forms of ritual; religion is especially concerned about providing guidance for moral conduct at moments when a person may face decisions involving the end of life. This is from the Volokh Conspiracy. As with everything over there, the comments are worth reading too.